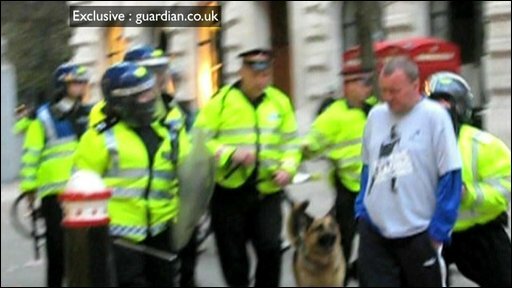 The officer captured on video apparently pushing a man during the G20 protests in London has been suspended, police have said. 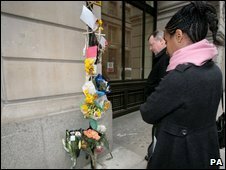 Ian Tomlinson, 47, died from a heart attack minutes after the incident on 1 April, near the Bank of England. The Metropolitan Police suspended the officer after the Independent Police Complaints Commission (IPCC) called for that action to be taken. The IPCC has launched a criminal investigation into the death. It has yet to interview the officer involved but said it intends to "as soon as possible". 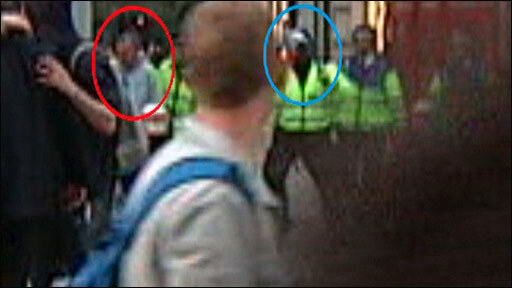 Additional footage broadcast by Channel 4 News appeared to show an officer hitting Mr Tomlinson with a baton. IPCC chairman Nick Hardwick has rejected suggestions that the police were not co-operating with the investigation. He told Channel 4 News: "The police, both forces, have given us the information that they have available when we asked them for that. It's not true that they haven't co-operated with us." Mr Hardwick said the City of London police were used to gather evidence and added that involving them in the investigation was the right thing to do. He said: "This is now a criminal investigation for which someone may face very serious charges. "The decision we took meant that we are now in the best possible position to bring that prosecution successfully if we need to do that." An earlier statement from the IPCC said: "The IPCC called for the officer to be suspended. The MPS has now informed us that the officer has been suspended with immediate effect." "Although decisions about suspension are a matter for the Chief Officer of the police, when there is an IPCC investigation, the police are obliged to consult with us over the suspension of officers. "In this case, we have expressed the view that the officer in question should be suspended from duty, in the public interest." A Metropolitan Police spokesman said: "In order to maintain public trust in the police handling of public order events, a Metropolitan Police territorial support group police constable has been suspended, effective immediately, in relation to the IPCC investigation into the death of Ian Tomlinson. "Although the Metropolitan Police consulted with the IPCC, the decision was taken independently by the Metropolitan Police having considered all the circumstances." Meanwhile, protester Safiullah Ghauri, 24, has told the BBC that he saw Mr Tomlinson lying on the ground in Threadneedle Street moments after he had collapsed. He said: "I appealed to everyone to call the police paramedics... When they came some of the protesters tried to stop the ambulance coming through. "They stood in front of it and I pushed one or two of them away and shouted at them to try to clear a way through. "Some of the protesters were getting out of hand." He said he thought some of the protesters' mistrust of the emergency services was a result of police behaviour during the demonstrations. Mr Ghauri, from Hayes in Middlesex, said he left a message for the IPCC but heard nothing back. The IPCC began an independent criminal probe on Wednesday after the first video footage of Mr Tomlinson being shoved to the ground emerged. It has ordered a second post-mortem examination as part of the inquiry. On Thursday the Met acknowledged Mr Tomlinson came "into contact with police" before he died. Initially the force said it was unaware he had sustained the alleged assault and said its officers' first contact with him was when they gave him medical aid before he died. But it denied trying to "cover up" the incident. 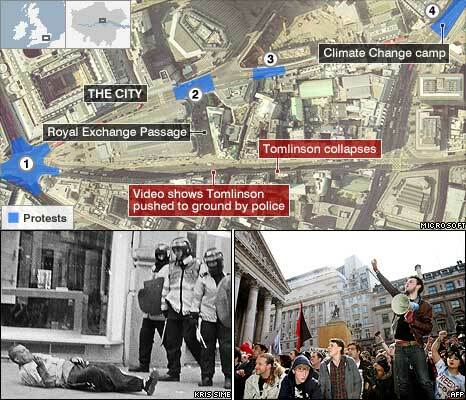 Some activists who participated in the demonstrations during the G20 meeting are expected to march from Bethnal Green police station on Saturday to the spot where Mr Tomlinson collapsed.